Dryocosmus kuriphilus Yasumatsu (Hymenoptera: Cynipidae), is one of the most serious pests attacking chestnut trees. Recently it was incidentally introduced into Northwest Italy and it is now spreading throughout Europe. This pest was successfully controlled in Japan by introducing a parasitoid, Torymus sinensis Kamijo (Hymenoptera: Torymidae), from China’s mainland. Following this successful experience, the parasitoid was introduced into Italy from Japan. One year of preliminary studies led to a successful method of rearing imported galls with a synchronization between the parasitoid’s emergence and the presence of the target galls in the field. In two consecutive years, a total of 2,117 individuals were released in several sites covering most of the infested area. There are encouraging data about the settlement of the parasitoid and its synchrony with the host’s cycle: from about 64,000 host galls collected in the field over 200 T. sinensis were reared. 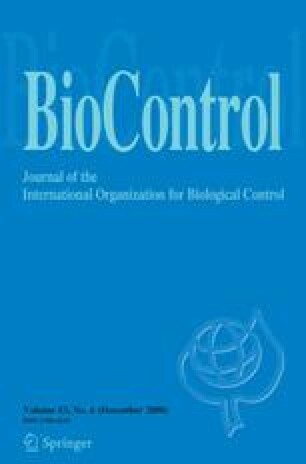 The role of native parasitoids associated with the chestnut gall pest in its Italian distribution range is also discussed. The D. kuriphilus biological control project in Italy is supported by Regione Piemonte. This work was supported in part by a Grant-in-Aid for Scientific Research (B) (No. 19380037) from the Japan Society for the Promotion of Science. The authors are deeply indebted to all the Japanese researchers, who contributed to the collecting of galls, and to Dr. Peter Mazzoglio, Dr. James Nicholls and Dr. Chiara Ferracini who kindly corrected the English text and gave useful suggestions. Thanks also to Davide Cuttini who pleasantly cooperated with the collection of galls in Italy.